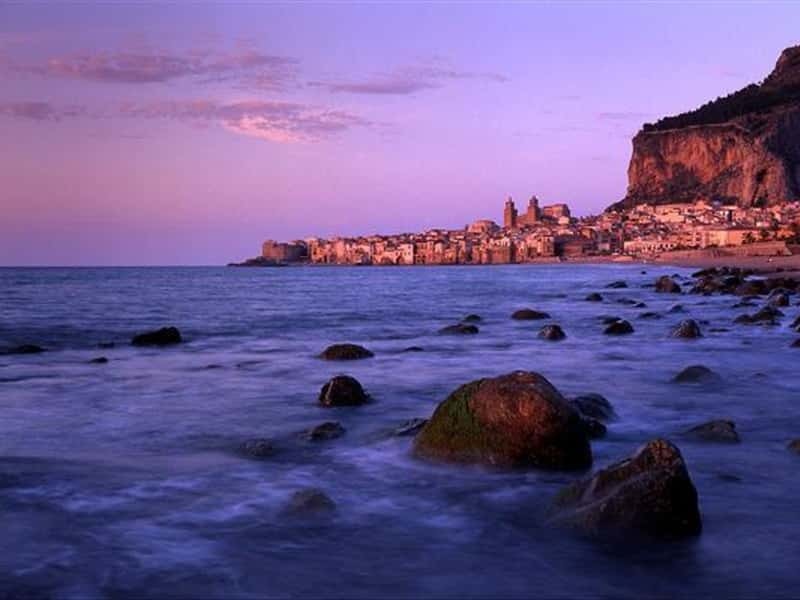 Generally high and jagged, the northern coast of Sicily overlooks the Tyrrhenian Sea from Peloro Cape (near Messina) to Lilibeo Cape (near Marsala); it is also characterized by numerous large bays, as for example the Gulf of Castellammare del Golfo, that one of Palermo, Termini Imerese, Patti, Milazzo and many small others, with beautiful fine sand beaches. Local oeno-gastronomic specialties are the Marsala DOC, a strong sweet wine, the orgeat (sweet), the almond milk (bitter-sweet), cannoli (a tube-shaped shell of fried pastry dough filled with a sweet filling usually containing ricotta cheese), cassata (a pound cake moistened with kirschwasser or an orange liqueur and layered with ricotta cheese, candied peel and chocolate), the arancini (fried rice balls, usually filled with ragù - meat sauce - but also with tomato sauce, mozzarella, peas and other things) and bread with spleen (panu cà meusa) - the latter two dishes are the gems of the crown of Palermo cuisine - and the fish cous cous, a typical course of Trapani area, imported by Maghreb. This destination web page has been visited 134,010 times.